It’s that time of year again! Honey bee populations are burgeoning in their hives and when that happens, a large part of the colony might separate out and take off. It’s how honey bee colonies reproduce. 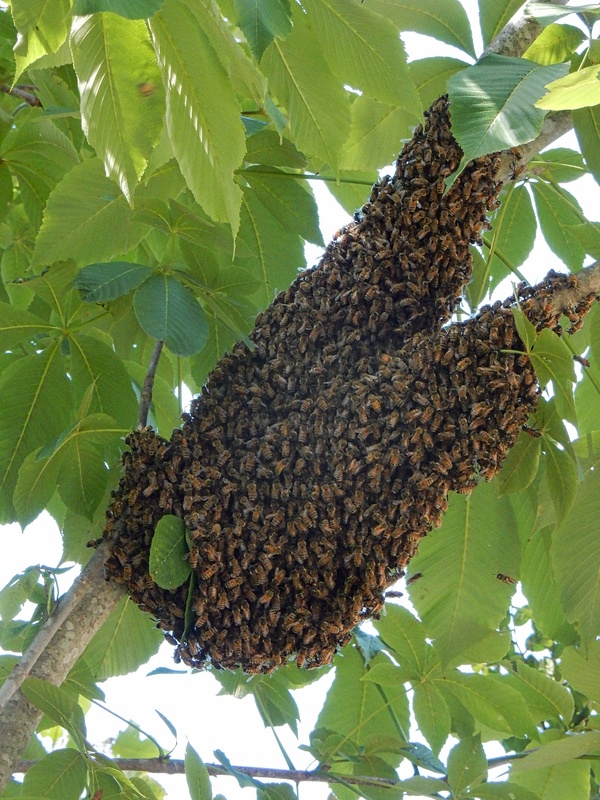 After leaving the hive, the worker bees, along with their queen, first find a place to hang for a while — in a tree, on a bicycle chain or a fence, or on any other comfy site — while scout bees look for a new place to call home. Geoff Leister was recently invited to talk on the nectar and pollen plants found in the Piedmont of North Carolina at the February 2019 Caswell County Beekeepers monthly meeting. A PDF on that presentation can be found HERE. Our first meeting of the New Year featured an informative and fact filled presentation by Dr. Mark Anthony Powers on how to evaluate the seriousness of a bee sting and how to ascertain the most suitable treatment. Dr. Powers is Associate Professor Emeritus of Medicine Division of Pulmonary, Allergy and Critical Care Medicine at Duke University and he is a NC Certified Journeyman Beekeeper. His presentation is based of a recent article published in the December 2018 issue of the American Bee Journal, Vol. 158 No.12 pp. 1327-1331. A PDF of Dr. Powers presentation entitled Bee Sting Allergy What You Need to Know is available for download HERE . *Strap down the lid and hive components if they’re not propolized. *Reduce hive wind profile by removing unnecessary boxes (feeders, for example). *Hives should be at ground level or on sturdy stands. Be sure solid bottom boards are tilted to let rain out. *Are your hives in danger of limbs or trees falling on them? Consider relocating hives. 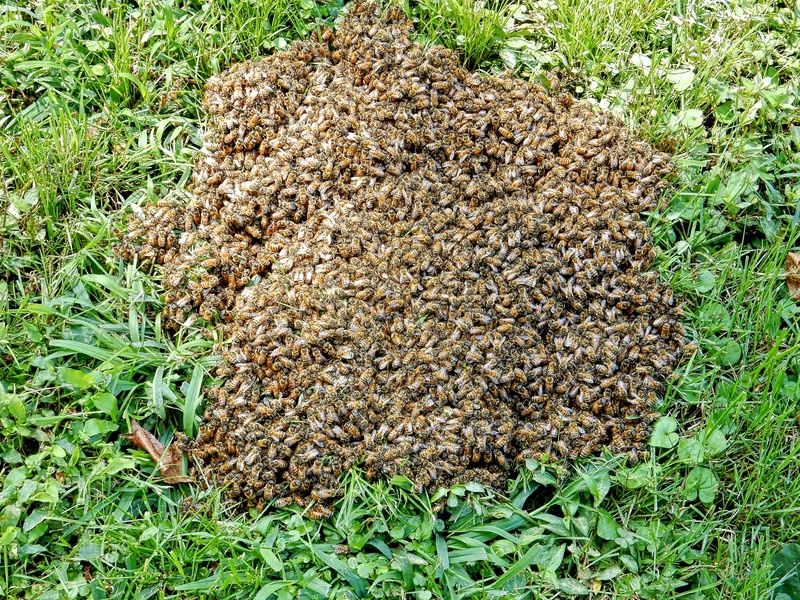 *Move hives from low-lying areas if there’s a flooding danger; bees will drown. *Register your hives at DriftWatch so you’ll be notified if spraying for mosquitos commences. Pesticide Operations Specialist, NCDA&CS – SPCAP for the following link to “Bee” Kind if You Spray for Mosquitoes” authored by Dr. Michael Waldvogel, Extension Specialist (Household & Structural Entomology), Entomology & Plant Pathology – NC State University. 1 – Use a buddy system. 2 – Know how to assess the six conditions of colony health. 3 – Take concise notes. 4 – Record any general notes and observations of each hive. The Pesticide Toxicity to Bees “Traffic Light” PDF file can be accessed along with other documents. The pesticides listed are arranged by Highly Toxic, Moderately Toxic and Relatively Nontoxic to bees. Specific pesticide uses are categorized as Microbiocide, Miticide, Insecticide, Fungicide, Herbicide, Growth Regulator, or Repellent. The Honey Bee Research Center at The University of Guelph located in Ontario, Canada produced 32 How-To Videos during 2016. They are excellent. You may watch these videos on their website HERE or select them from Youtube HERE. ENJOY! The Honey Bee Research Center maintains populations of a hybrid strain of honey bees known as Buckfast bees. This is a man-made bee race and is a cross of many strains of bees, developed by Karl Kehrle, also known as Brother Adam, who was in charge of beekeeping from 1919 to about 1995 at Buckfast Abbey in Devon in the United Kingdom, where the bees are still bred today. Notes about the different types of Honey Bees, including Buckfast, are discussed in Beekeeping Notes 1.12 from NC State.